"Paul, what time will it rain at my exact GPS coordinate? Please be precise." If only the weather worked that way. Summertime showers are random, spotty and notoriously imprecise. Unlike weather systems from October through April, when precipitation tends to be more widespread, summery "convective" rainfall is often hit or miss. In spite of Doppler radar and amazing supercomputers, we still can't predict, with a high degree of confidence or specificity, if a specific location will get rain at a specific time. 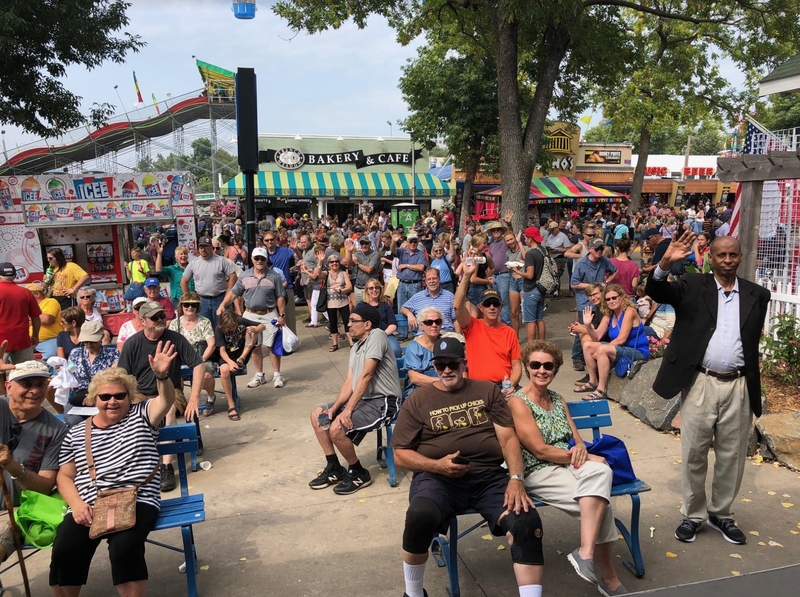 Which brings us to the Minnesota State Fair. If you are heading out today, lug along something waterproof. It won't rain all day, but a few hours of showers are likely as a warm frontal boundary bullies its way north. At least it'll be comfortable, with highs in the 70s. The driest days for people-watching and eating yourself into a fair-weather coma? Saturday, again next Tuesday and Wednesday. T-storms sprout Sunday, with another wave of rain Monday; again late next week. Regardless, the 7-Day Outlook calls for deep-fried, sugar-coated fun! Not Quite as Wet. At least for the MSP metro, where the latest NAM model run prints out closer to .25" of rain by tonight. In contrast some 1-2" amounts are expected over northern Minnesota and Wisconsin. Map: pivotalweather.com. Hurricane Lane has started to move to the northwest, which will help bring the system dangerously close to the Hawaii Islands over the next two to three days. While some weakening is expected, it is likely to remain a hurricane into the first half of the weekend. 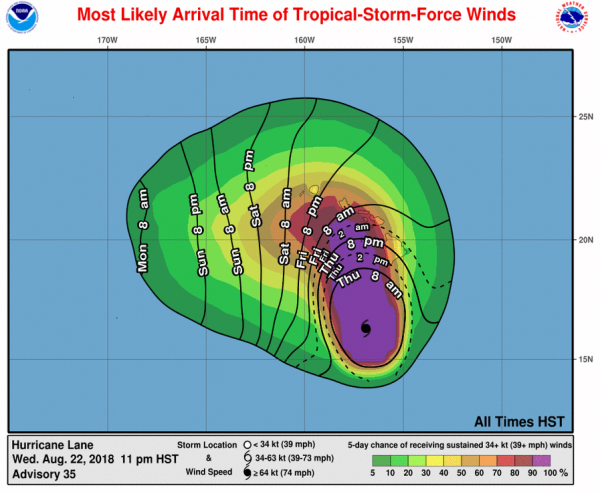 Lane will bring a multitude of threats to Hawaii, including dangerous winds that could top hurricane force, excessive rain that could lead to flash flooding, and large surf along the coast. Already over 13” of rain has been reported on the Big Island, and flash flooding has occurred in Hilo. Hurricane Warnings are in effect for Hawaii County, Maui County and Oahu. Hurricane Watches are in effect for Kauai. We are also tracking two tropical systems in the western Pacific – Tropical Storm Soulik and Typhoon Cimaron. Soulik will impact the Korean Peninsula over the next day or so, and Cimaron will make landfall the southern Japan mainland (mainly west of Tokyo). Hurricane Lane image above: NASA. Lane On Satellite. 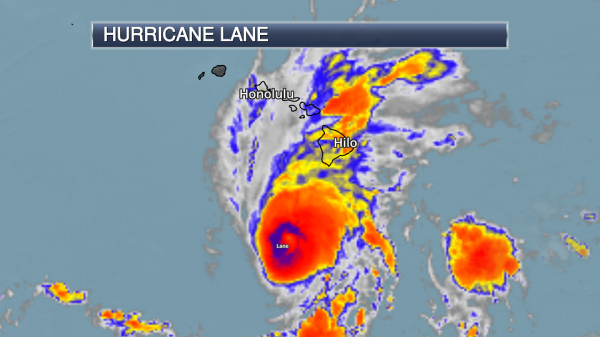 Lane has been slightly weakening over the past few hours as the system continues to track toward Hawaii. 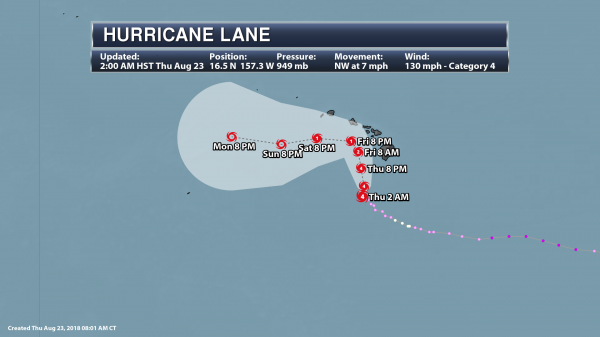 As of the 2 AM HST update from the Central Pacific Hurricane Center, Lane had sustained winds of 130 mph and was moving to the northwest at 7 mph. 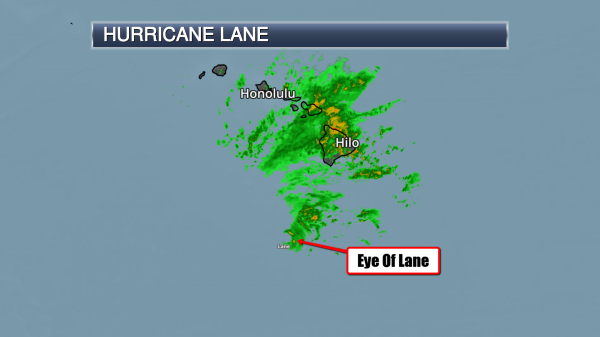 The eye of Lane was located about 230 miles south-southwest of Kailua-Kona, or about 335 miles south of Honolulu. Heavy Rain Already Falling In Hawaii. Rain bands from Hurricane Lane have already been impacting parts of the Hawaiian Islands. On the Big Island, almost 14" of rain has fallen at the Waiakea Experimental Station in the past 24 hours, with 12.29" at Mountain View and 8.75" at the Hilo airport. This rain has caused flooding in Hilo, with the Bayfront Highway reported closed due to flooding according to the National Weather Service. However, you can see that the eye of Lane is still far south of Hawaii, appearing toward the bottom extent of what the radar can see. Forecast Track. Lane will continue to move somewhat slowly to the north and/or northwest over the next couple days. This motion will continue to bring Hurricane Lane dangerously close to the Hawaiian Islands through the end of the week. By Saturday, a sharp turn to the west should occur, but it is difficult to know exactly when that will occur. It is important to not directly focus on the exact path of the system, as dangerous weather conditions from Lane will extend further out from the center of the storm. Impacts from Lane – including damaging winds, heavy rain, and storm surge - are still expected across all of the main Hawaiian Islands into the weekend. Lane should continue to slowly weaken over the next couple days before rapid weakening occurs into the weekend as upper-level winds increase, helping to disrupt the system. Hurricane Watches and Warnings. Due to the threat of hurricane force winds from Lane, Hurricane Warnings are now in effect for Hawaii County, Maui County and Oahu – including Hilo, Kona, Kahului and Honolulu. Hurricane Watches are in effect for Kauai County including Lihue. Most Likely Arrival Of Tropical Storm Force Winds. Tropical storm force winds of 39+ mph will start to reach the Big Island of Hawaii throughout the day as Lane approaches, spreading across Maui County later today and toward Oahu late tonight. Tropical storm force winds will reach Kauai County by Friday night. Wind Threat. Right now the greatest threat of hurricane force wind gusts will be across Oahu and far eastern parts of Maui County starting as early as tonight. Some hurricane force wind gusts can’t be ruled out across the other islands as well, though the potential is greater to see higher-end tropical storm force winds across these areas. You can view an interactive map of these threats by clicking here. Peak Wind Gusts Friday. 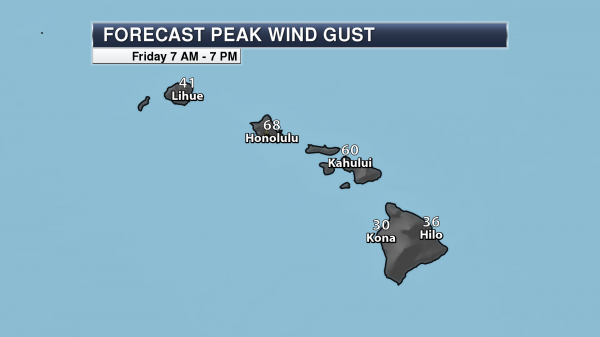 The strongest wind gusts as we head into Friday across Hawaii will likely be across Maui County and Oahu, with wind gusts up to at least 60 mph possible for areas like Kahului and Honolulu. Peak Wind Gusts Saturday. As Lane moves east into Saturday, the strongest wind gusts are expected across Kauai County, with wind gusts over 50 mph possible in Lihue. Heavy Rain Threat. 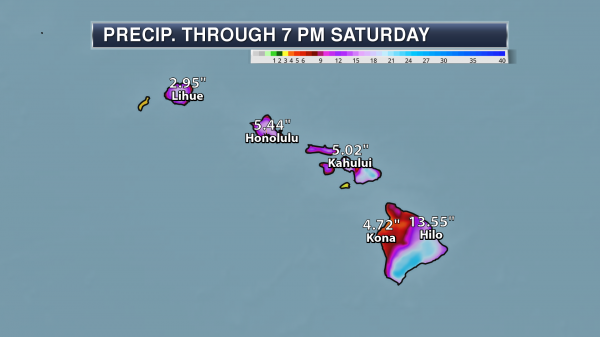 Lane will also bring the potential of very heavy rain to the Hawaiian Islands, with the potential of at least 10-20” through Saturday. Some isolated areas could receive 30” of rain. This heavy rain could lead to flash flooding. Flash Flood Watches. Due to the threat of heavy rain with Lane, Flash Flood Watches have been issued for all of Hawaii through late Friday Night. Storm Surge Threat. We will also be watching the threat of storm surge flooding. The greatest storm surge threat will be across parts of western Hawaii County and southern Oahu, where storm surge flooding of at least three feet above normally dry ground will be possible. However, most south and west-facing coastlines could see storm surge flooding of at least a foot. Two Tropical Systems In The West Pacific. 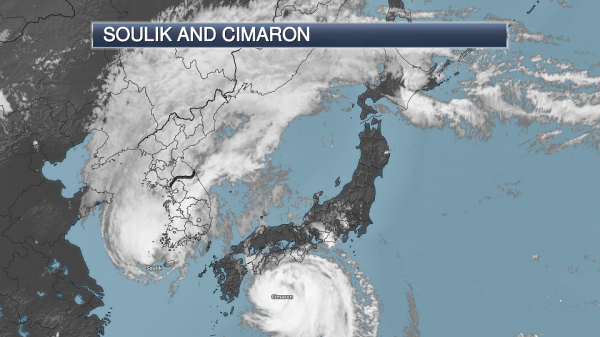 Over in the western Pacific, we are tracking two tropical systems – Soulik, which will impact South Korea over the next day or so, and Cimaron, which will make landfall in southern mainland Japan soon. As of Thursday morning U.S. time, Tropical Storm Soulik had winds of 70 mph and was moving to the north-northeast at 7 mph. 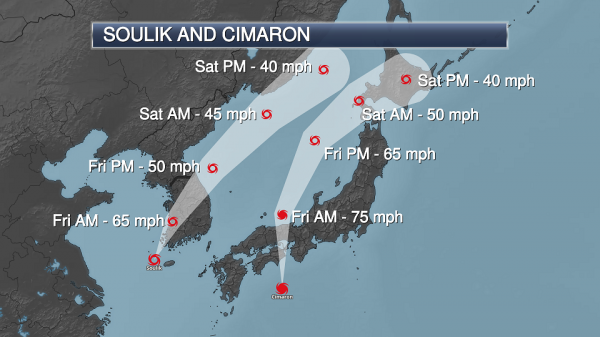 Typhoon Cimaron had winds of 90 mph and was moving to the north at 23 mph. Soulik will continue to weaken over the next couple days, bringing damaging wind gusts and flooding rains to South Korea through Friday. Cimaron will continue to move toward southern mainland Japan, making landfall soon with equivalent winds of a Category 1 hurricane. 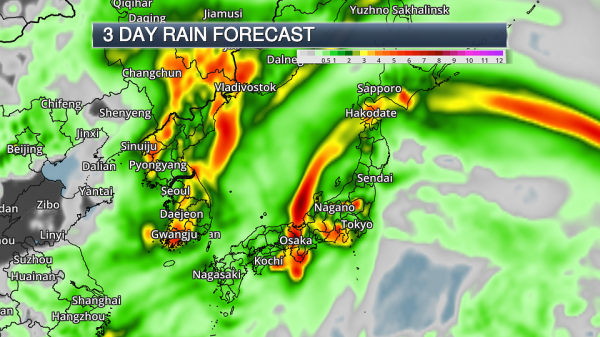 Cimaron will continue to bring the potential of strong winds, heavy rain, and storm surge along with it, but the highest impacts from this system will be west of Tokyo. Graphic credit: AerisWeather and Praedictix. Forecast Rainfall. Heavy rain will be a threat with these two systems, with areas along the path of the systems potentially picking up 3-12"+ of rain. This could lead to flash flooding and mudslides. Forecast Calls for More Smoke. Here's the midday Thursday visible (Geo-color) image, showing thick palls of wildfire smoke over the western USA and much of Canada. Image credit: NOAA and AerisWeather. The Next Major Innovation in Batteries May Be Here. Because everything (including clean, renewable energy) is being disrupted. Quartz explains: "Lithium-ion batteries were first introduced to the public in a Sony camcorder in 1991. Then they revolutionized our lives. The versatile batteries now power everything from tiny medical implants and smartphones to forklifts and expensive electric cars. And yet, lithium-ion technology still isn’t powerful enough to fully displace gasoline-powered cars or cheap enough to solve the big energy-storage problem of solar and wind power. Dave Eaglesham, the CEO of Pellion Technologies, a Massachusetts-based startup, believes his company has made the leap beyond lithium-ion that will bring the battery industry to the next stage of technological disruption. He and his colleagues have accomplished something researchers have been struggling with for decades: they’ve built a reliable rechargeable lithium-metal battery..."
How Microsoft Tackles Russian Hackers - And Why It's Never Enough. A digital game of whack-a-mole, right? Here's an excerpt from WIRED.com: "...Specifically, Microsoft has used a technique known as sinkholing, a way to divert network traffic from its planned destination to a different server. Microsoft combines its broad visibility into its billions of users, and the chops of its internal Digital Crimes Unit, to get a jump on phishing sites like the ones Fancy Bear established, get legal permission to take over those domains, and then send any traffic that heads their way to oblivion instead. "It’s not a gimmick, but it’s also not an innovation," says David Kennedy, CEO of the threat tracking firm Binary Defense Systems, who formerly worked at the NSA and with the Marine Corps' signal intelligence unit..."
Even Teens Are Worried About Too Much Smartphone Use. CNN.com has the story: "More than half of all teenagers think they use their phones too much, according to a Pew Research Center survey released Wednesday. A quarter of teens reported feeling anxious, lonely and upset without their phones. Girls were more likely to report feeling that way. Screentime and phone addiction have received increasing attention from the companies selling them. Google, Facebook and Apple have created tools to help people cut down on the amount of time they spend using their devices. Doctors and other experts worry that phones, tablets and other screens might affect everything from cognitive development to social skills. The Pew study is the latest in its series of inquiries focusing on kids aged 13 to 17..."
The Life-Changing Benefits of Living with a Random Roommate in College. Food for thought, courtesy of Quartz: "Meeting your freshman-year roommate has long been a suspense-filled rite of passage for new college students. But these days, there’s a lot less mystery about who you’ll be bunking with: Many colleges let students pre-select roommates using Facebook or other matching platforms. Now the trend seems to be undergoing a reversal as colleges recognize the value of randomized roommate assignments. Their reasoning? It’s become all too easy to pre-select a roommate online who shares the same religion, political views, class background, or living habits as you. The hope is that random pairings will foster connections between students of different backgrounds, helping to expand their perspectives—which, colleges argue, is what the undergraduate experience is all about..."
Photo credit: "Everyone has a good freshman year roommate story." REUTERS/Brian Snyder. 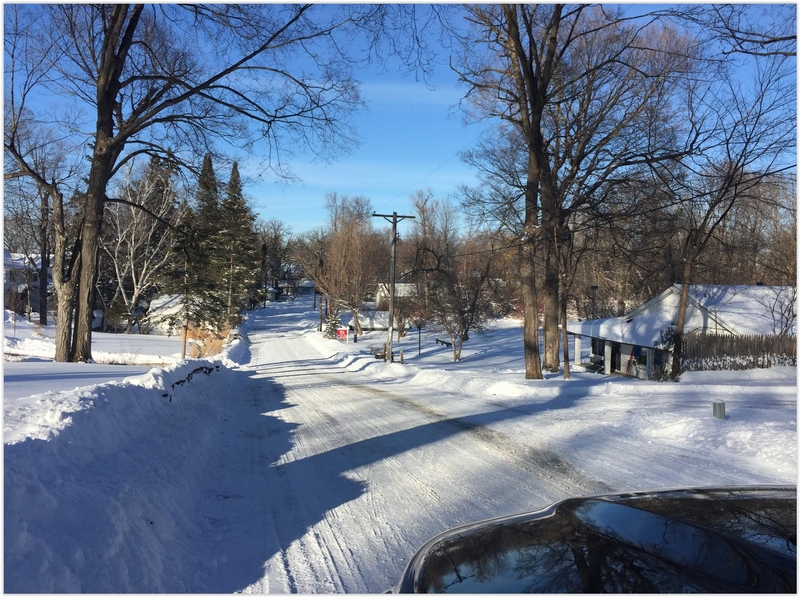 81 F. high temperature yesterday in the Twin Cities. 80 F. average high on August 23. 77 F. high on August 23, 2017. August 24, 2006: Tornadoes and large hail strike southern Minnesota. One person died and 37 were injured when a strong tornado began 4 miles west-southwest of Nicollet in Nicollet County, and moved almost due east for 33 miles to near Waterville in Le Sueur County. Many storm chasers captured the tornado on video. The largest hail reported was grapefruit-sized at New Prague in Scott County. August 24, 1934: Early cool air invades southern Minnesota. Rochester and Fairmont have lows of 34 degrees. More Hurricanes for Hawaii? Will warming oceans increase the risk for the Hawaiian Island Chain? 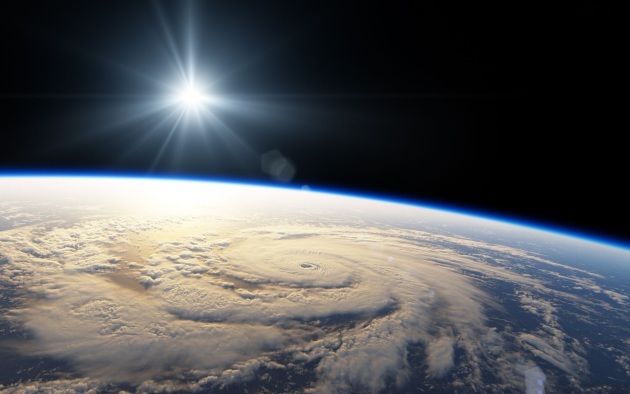 Here's an excerpt of a study done in 2013, highlighted at EurekAlert: "...In our study, we looked at all tropical cyclones, which range in intensity from tropical storms to full-blown category 5 hurricanes. From 1979 to 2003, both observational records and our model document that only every four years on average did a tropical cyclone come near Hawaii. Our projections for the end of this century show a two-to-three-fold increase for this region," explains Murakami. 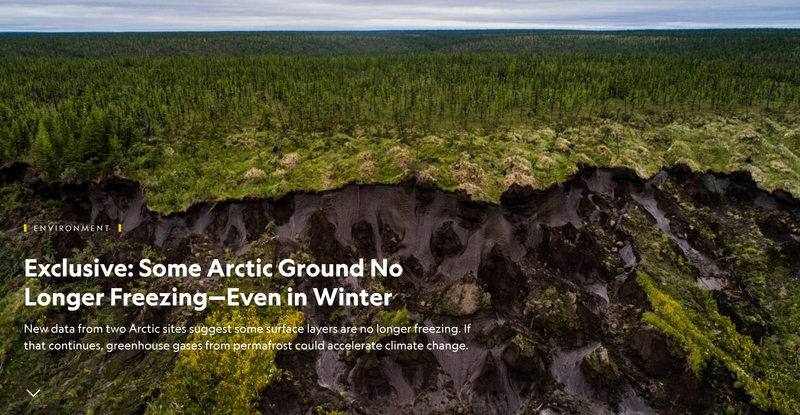 The main factors responsible for the increase are changes in the large-scale moisture conditions, the flow patterns in the wind, and in surface temperature patterns stemming from global warming. Most hurricanes that might threaten Hawaii now are born in the eastern Pacific, south of the Baja California Peninsula..."
Sea Level Rise is Eroding Home Value, and Owners May Not Even Know It. The Washington Post reports: "...Boineau is one of many homeowners on the front lines of society’s confrontation with climate change, living in houses where rising sea levels have worsened flooding not just in extreme events like hurricanes, but also heavy rains and even high tides. Now, three studies have found evidence that the threat of higher seas is also undermining coastal property values as home buyers — particularly investors — begin the retreat to higher ground. On a broad scale, the effect is subtle, the studies show. The sea has risen about eight inches since 1900, and the pace is accelerating, with three inches accumulating since 1993, according to a comprehensive federal climate report released last year. Scientists predict the oceans will rise an additional three to seven inches by 2030, and as much as 4.3 feet by 2100...."
Feeling Sick? You May Have a Case of Climate Change. Some interesting statistics and trends highlighted in a post at HuffPost: "Climate change is, quite literally, making us ill. The Centers for Disease Control and Prevention reported this spring that diseases from mosquito, flea and tick bites tripled in the U.S. between 2004 and 2016, with more than 640,000 cases seen during that period of time. Maine alone saw a 20-fold increase in cases of the tick-borne illness Lyme disease. The danger showed no sign of abating this year, with ticks crawling into Mainers’ lives as early as May. Their premature arrival was largely a product of warmer temperatures in the region ― temperatures that reflect the broader trend of global climate change. It is perhaps for this reason that Lyme disease—once a regional problem largely confined to New England—has now been detected in all 50 states...."
Graphic credit: CDC. 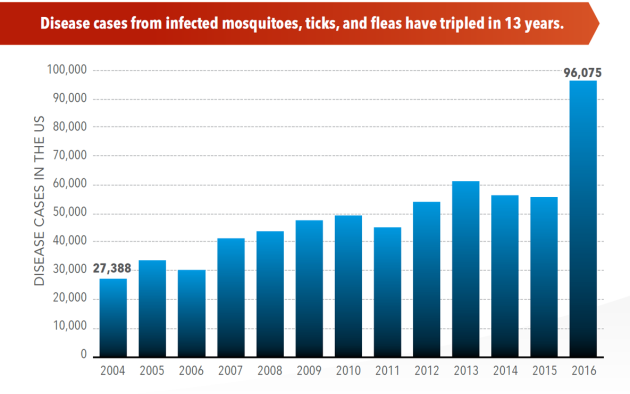 "Disease cases from infected mosquitoes, ticks, and fleas have tripled in 13 years." 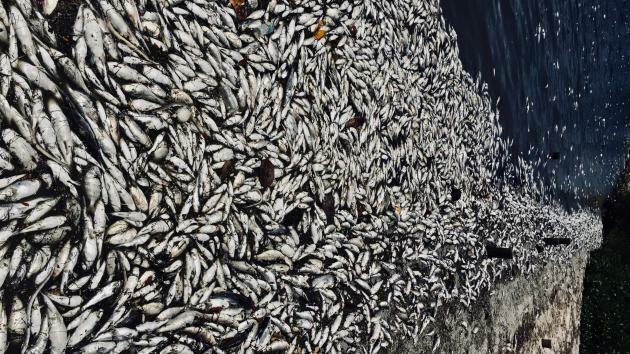 Photo credit: "The shore isn’t charming anymore." Ephrat Livni.